An ideal choice for your space, the Jeffrey Court Honey 12 in. x 3/4 in. 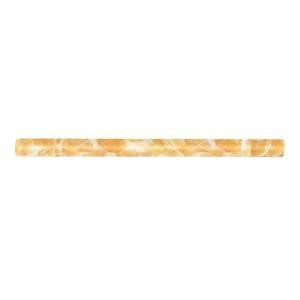 Gold Onyx Dome Moulding Listello Wall Tile features a gold color with a moderate variation in tone to help accent many home interiors. This beautiful onyx tile has a semi-vitreous water absorption and a smooth, low-sheen finish to suit your needs. Designed for wall use, this onyx tile is certified by the Marble Institute of America. 0.06 square foot per piece, each piece sold individually. Piece weight equals 0.55 lb. Buy online Jeffrey Court Honey 3/4 in. x 12 in. Onyx Dome Tile 90073, leave review and share Your friends.